The book is beta ready! Woot! I have finally gotten to a beta-ready manuscript of the book. That is, I’ve reached a point where I feel the writing and editing are almost done – that the topics are well-written, and in the correct order. And the phrasing is well-polished. So I have sent it out to a few select beta readers for their feedback, before sending it out to the artists I interviewed. I’m hoping to start sending it out by Thursday or Friday. Meanwhile, I’ll be prepping summaries of each artist’s quotes, requests for photos, etc. to send out to each of the 22 artists who are included in the book. Lots of stuff still to be done, just not that much writing/editing. I have also spent two solid days studying jacquard design and ArahWeave (jacquard design software). While I have only scratched the surface of the topic, I am feeling considerably less bewildered. I believe I am starting to understand the conceptual framework for jacquard design – how the system “thinks”. I’ve also, thanks to the ArahWeave manuals and tutorials, begun to develop an understanding of how one translates these ideas into actual fabric design. In the course of exploring the ArahWeave tutorials, I’ve also developed an interest in velvet and matelassÃ©. I’m hoping my next warp will allow me to weave both – not sure, though, as the velvet will have to be woven on two warps, wound onto separate beams. 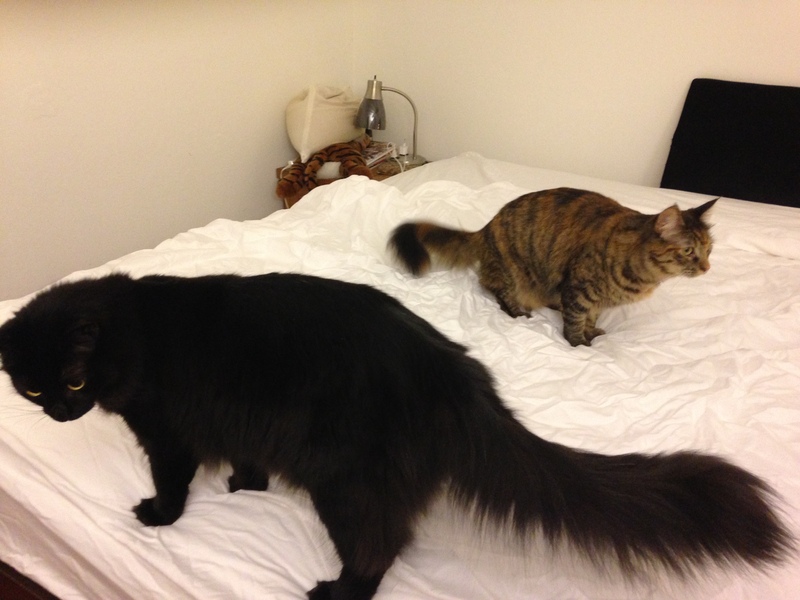 (One for the ground cloth, one for the pile.) That may make it incompatible with matelassÃ©. But now that I’ve finished my intense focus on the book, hopefully I can try my hand at these new structures. I need to come up with something to weave soon, before I finish the sea turtles! Tomorrow I’m going back to work. It’s been a pleasant month of post-surgical recovery, but insofar as I’m mostly recovered, it’s time to put on my professional hat again. I’m not looking forward to the first few days back – I’m guessing I’ll return to 1000+ unread emails in my inbox, and the usual set of fires to fight. 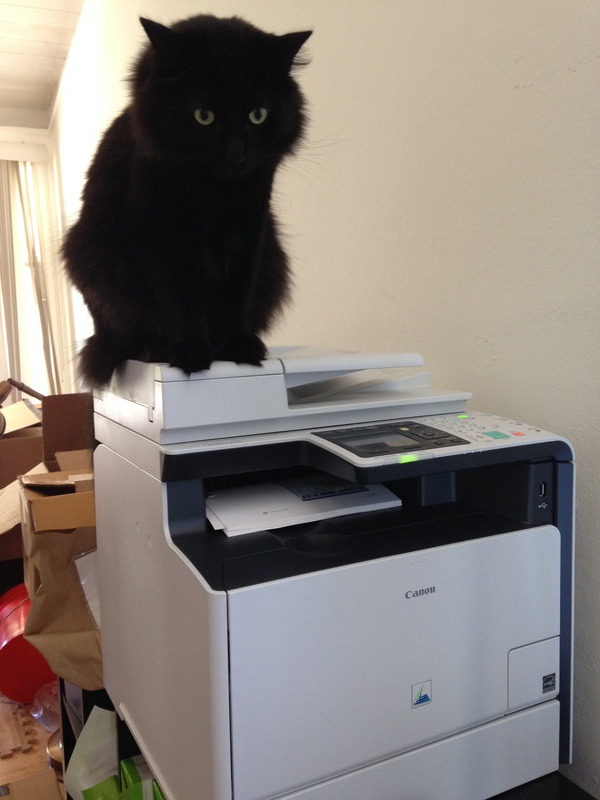 On the other hand, that is what I’m paid for, and I’m reasonably good at it. And I enjoy it, most of the time. 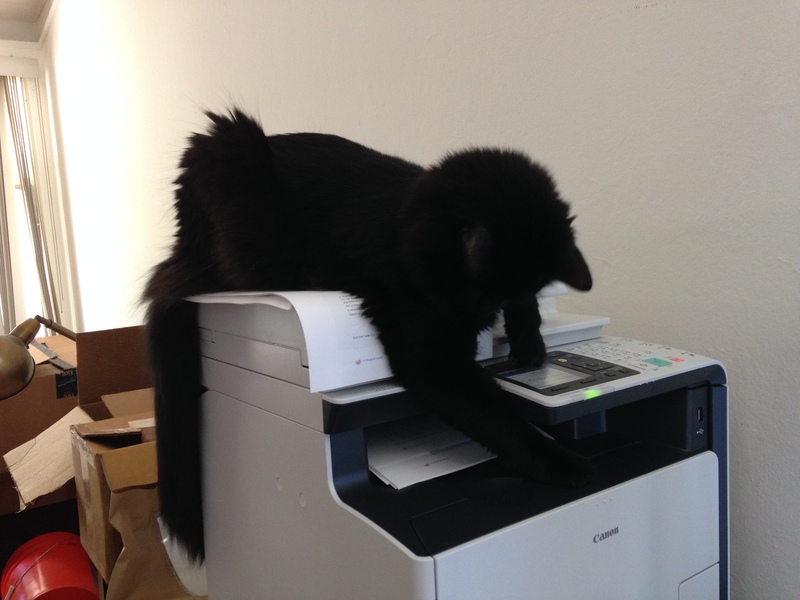 Meanwhile, between my printing out the manuscript and the ArahWeave manual, it has been a busy time for our laser printer. 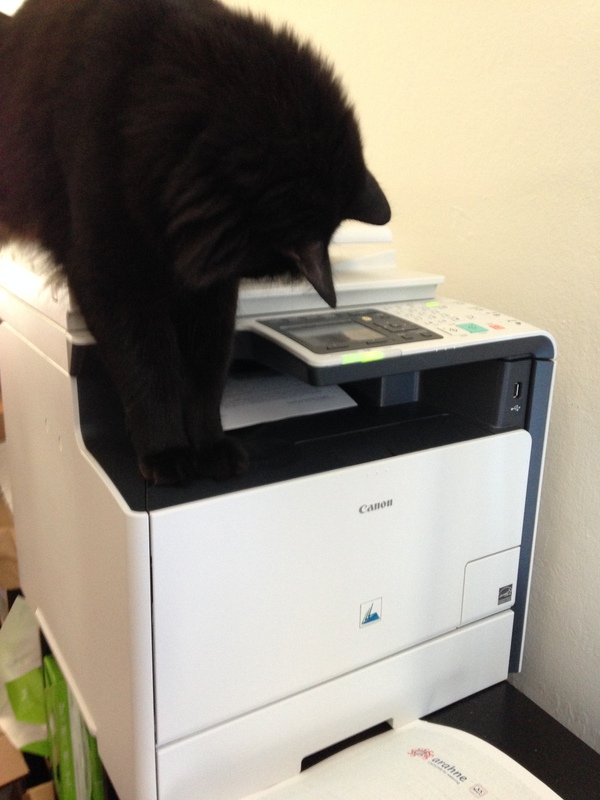 Which of course makes the cats happy, since a duplexing printer is endlessly fascinating. 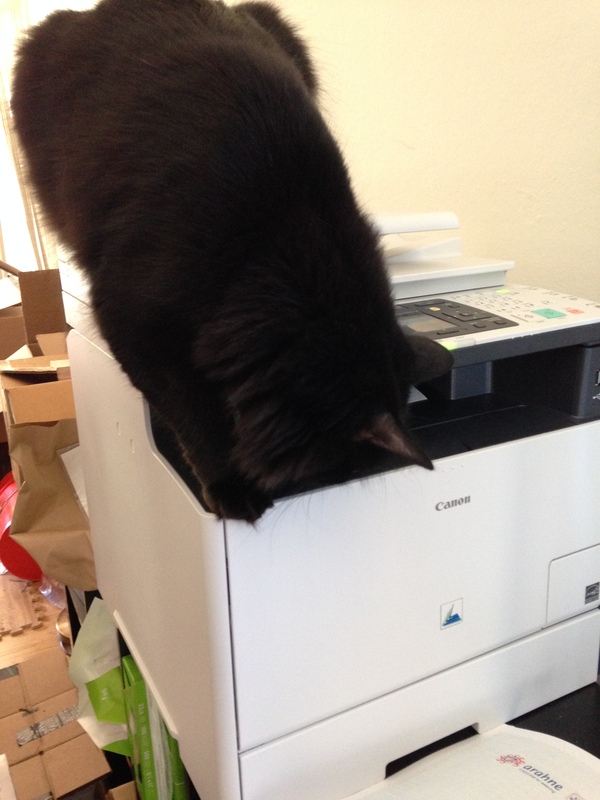 Here are a few shots of Fritz in action – sadly, I did not capture the moment where he tried to stick his entire head (and both front legs) into the printer while hanging upside down from the top of the printer. Just as well, I suppose – I was laughing so hard it would probably have come out blurry, anyway.